The government released new poverty statistics this week. The number of Americans living in poverty rose again last year. Thirteen million children — nearly one in every five — lives in poverty. Close to 25 percent of all African Americans live in poverty. Twenty-three percent of the population in New Orleans lives in poverty. Those are chilling numbers. Because of Katrina, we have now seen many of the faces behind those numbers. Poverty exists everywhere in America. It is in Detroit and El Paso. It is in Omaha, Nebraska and Stockton, California. It is in rural towns like Chillicothe, Ohio and Pine Bluff, Arkansas. Nearly half of the children in Detroit, Atlanta and Long Beach, California live in poverty. It doesn’t have to be this way. We can begin embracing policies that offer opportunity, reward responsibility, and assume the dignity of each American. There are immediate needs in New Orleans and the Gulf Coast, and the first priority is meeting those, but after that, we need to think about the American community, about the one America we think we are, the one we talk about. We need people to feel more than sympathy with the victims, we need them to feel empathy with our national community that includes the poor. We have missed opportunities to make certain that all Americans would be more than huddled masses. We have been too slow to act in the face in the misery of our brothers and sisters. This is an ugly and horrifying wake-up call to America. Let us pray we answer this call. Now is the time to act. But from what historical tradition does Edwards’ rhetoric stem? Generally speaking, there are two types of poverty advocacy in American political history — agrarian radicalism and urban populism. The two movements are linked, but subtly different, with two very different historical pedigrees. We believe that the power of government-in other words, of the people-should be expanded (as in the case of the postal service) as rapidly and as far as the good sense of an intelligent people and the teachings of experience shall justify, to the end that oppression, injustice, and poverty shall eventually cease in the land. That’s Ignatius Donnelly, the colorful Minnesota co-founder of the Populist Party, propounding the new party’s 1890 Omaha Platform. The language is fulsome and pregnant with meaning — there’s nothing pedestrian about a line like “We have witnessed for more than a quarter of a century the struggles of the two great political parties for power and plunder, while grievous wrongs have been inflicted upon the suffering people.” In addition, Donnelly speaks directly to the struggle between urban capitalists and rural farmers. The implications of not only class but rural/urban warfare could not be more clear. The government of New York City, as LaGuardia has proved to all of us, is not the personal property of ANY MAYOR, and certainly NOT the property of any gang of tin-horn politicians selling city services for votes or money It is YOUR Government. It belongs to you. It is there to serve YOU–not any District Leader. When a mother wants to bring her baby to a health station TODAY she doesn’t have to “know” any one or “see” any one. And that goes straight down the line, in every department under the Mayor. Think back a bit. Think back to Tammany days, and ask yourself whether you like Tammany service or HUMANIZED SERVICE. 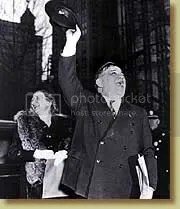 That’s part of a campaign article in favor of Fiorello LaGuardia, the legendary populist mayor of New York city from 1933-1945. Notice the stark difference in rhetoric from Donnelly’s agrarian radical document: the language is much more down-to-earth and pedestrian; the focus is on essential services and good government, not the ridding of evildoers from the halls of power. Why this distinction between urban and rural populism? Perhaps when you can walk by City Hall or the state capitol building, it’s easier to think of politicians as just another group of very ordinary people. When you’re out in the boonies, government seems as far away as a fairy tale, subject to great climactic struggles between kinghts and demons. Many of our children still go to schools that the WPA constructed; many of our homes are lighted because of dams that the PWA built; many of our families still hike on trails that his CCC blazed. That’s why trailer parks are not the answer. In fact, if we know anything from a half century of urban development, it is that concentrating poor people close to each other and away from jobs is a lousy idea. If the Great Depression brought forth Hoovervilles, these trailer towns may someday be known as Bushvilles. New Orleans, in so many ways, shows the two Americas that I have talked about in the past and something that I feel very personally. And it also exemplifies something that I’ve learned since the last election, which is that it’s great to see a problem and to understand it. It’s more important to actually take action and do something about it. And I think that’s why I’m in New Orleans, is to show what’s possible when we as Americans, instead of staying home and complaining about somebody else not doing what they’re supposed to, we actually take responsibility and we take action. All based around city-dwelling and the attendant injustices thereof. It is important not to overlook rural poverty, which is particularly prevalent in the South. Eighty-two percent of the poorest rural counties in America are in the South. We need to offer tailored solutions to meet the needs of America’s small towns and rural communities. We should invest in community colleges, which are particularly important in rural areas and open rural small business centers to provide investment capital and advice to help entrepreneurs get off the ground. But even here, his choice of phrasing — “It is important not to forget rural poverty” — suggests that there is some danger of his forgetting it. Based on all this evidence, I agree with Elle: Edwards is an urban populist, not an agrarian radical. So how do you explain the fact that Edwards’ strongest support comes from rural areas? This is the most astonishing poll of the cycle so far. 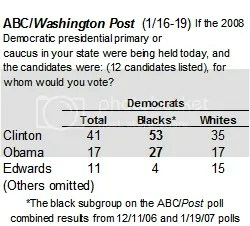 This poll was taken by WaPo in an attempt to prove that Obama doesn’t have African-American support locked up. It does that, but the most shocking statistic is the Edwards numbers. The crusader for the inner-city poor is backed by four times FEWER blacks, who form a disproportionate percentage of the urban poor. What is going on here? …the Southern good ol’ boy thing? i’m not sure if you meant what he says or his accent, but i hope people don’t underestimate the effect of the latter. i always tell the story of how i liked watching CSI: Miami, but for the longest time I wouldn’t b/c of Emily Proctor’s voice. she sounded like the white women from my rural hometown and the tension and memories associated with that means that her voice grates on my nerves. what it might signal, in edwards’s case, is that beneath the rhetoric, he’s still a white southerner. the associated steretypes are damaging. …not all work is honorable – despite the New Deal era rhetoric of the nobility of manual labor, it still remains dangerous, exploitative, and unremunerative. And it’s shot through with racist and sexist assumptions and practices that either make it hellish for women of color in particular, or deny them any place at all. Ultimately that’s what troubles me about Edwards’ language. What does it offer those who cannot work, or those who are underemployed, or exploited in their labor? It runs the very real risk of simply reinforcing existing inequalities. I agree with both of these arguments for Edwards’ curious inability to connect with African-Americans, a critical sector of the urban poor. But there is a flip side to this equation for Edwards: the flaws in his candidacy for the urban poor are strengths perfectly equipped to appeal to the rural poor. His southern good ol’ boy demeanor, so out of place in the cities, makes him fit right in with farmers and white Southerners. His arguments in favor of the right to work are also a perfect fit for rural dwellers, given that farm-based communities are used to a higher quality of work experience than those in cities — the difference between agricultural work and factory work. His appeal to the rural poor is also Edwards’ greatest strength for a Democratic ticket. With all due respect to the urban poor, the only way they’re going to vote for a Republican is if Rudy Giuliani, another urban populist, is the nominee — which I’m pretty certain won’t happen. The rural poor, on the other hand, are a critical swing constituency, largely because they feel neither party is interested in their issues. For this reason, the rural poor have always been susceptible to joining third-party splinter groups; they were the core constituency of the late-1800’s Greenbacker and Populist parties, Robert La Follette’s agrarian Progressive Presidential candidacy in 1924, and Strom Thurmond and George Wallace’s Southern conservative bids in 1948 and 1968. John Edwards is perfectly positioned to appeal to this group — I’d guess they form the strength in his poll numbers, as further evidenced by his strong numbers in Iowa. If I worked on Edwards’ campaign, I’d suggest that, without abandoning his urban populism, he retool his rhetoric, fashioning it into a sharp defense of the rural poor. The day Edwards becomes an agrarian radical will be the day Edwards sweeps the field. The problem with analyzing rhetoric — and remember, when I was in English graduate school, that is what I expected to spend a lifetime doing — is that it is rhetoric. 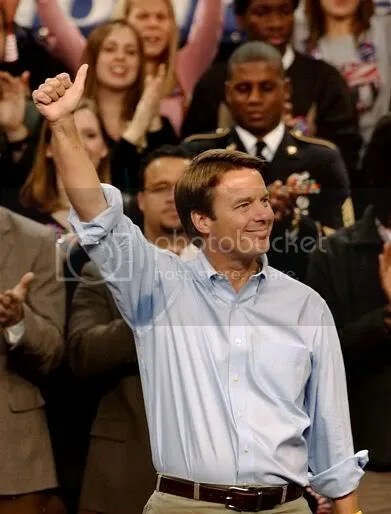 Instead of analyzing the language of emails or snippets from selected speeches, it might be useful to think about the man himself, his career, his 2004 primary policies, his activities since 2004, and his 2008 policies. He comes from the rural South. I remember the first time I went to Robbins. Actually it was with a boyfriend I had before I ever met John. (Improbably, his name is John Kennedy.) We parked in front of a small old theatre named, of course, the Dixie Theatre. There were two by fours across the door and a faded sign that said “Closed.” Years later, John told me that the theatre closed after someone threw a soda bottle through the screen and the theatre didn’t make enough profit to buy a new one, so they closed. The mobile home plant where he had his first job – closed. The chicken processing plant that was the largest employer – closed. The textile mill in which John’s father worked – closed. As tobacco has struggled, so have the farms in the whole state. It is impossible, iterally impossible for a thinking person not to have these circumstances inform your adult beliefs. And they informed John. His career before work was representing, for the most part, families in the worst times of their lives — often fighting for care and nedical treatment for their children. Where were they? Oh, some were in Charlotte — maybe a couple over 20 years –, but most were in small towns with aging hospitals an hour’s drive away or starving for doctors. A choice of doctors was almost unheard of. The most up to date equipment out of the question. And he was informed again about the hardships faced in rural America. In 2004, during the primaries, John was the ONLY candidate with a rural agenda. A fleshed out, thoughtful agenda. He had an urban poverty agenda too — it was called Cities Rising, if memory serves me. And then he spent two years working on poverty issues, some of it under the auspices of the new Center on Poverty, Work, and Opportunity at UNC. What he found is that poverty and hardship don’t have a single home address — rural or urban. There is no single solution to the obstacles to success and security, although some of the solutions we know work cross these demographic boundaries. Life and life’s problem, it turns out, do not care much about rhetoric. And as for distinctions made above, I think I (as opposed to John, whose opinion on this I do not know) disagree with the way you have framed it, which may be a reflection of the time in which the rhetorical examples are drawn — the 1890’s and 1930’s. The rhetoric (if backed by action) that rural America wants in 2007 is complex – a combination of what you suggest, an intervening government, and what you don’t suggest, a less invasive government. And the urban example you gave is less “urban” than it is personal. You could say those words or words like them — and I suspect John has — anywhere in this country. And I need to say how strongly I disagree with one of the quotations that is used to explain the divide. John does not agree, I do not agree that not all work is honorable. All work is honorable. (How we treat some workers or permit them to be treated is not always honorable.) And work by those who can work is a responsibility that each of has in a society where we depend on those who can to be in a position to help those who can’t. Will you find academicians who suggest that there should not be a personal responsibility piece in the answer to poverty? Yes, of course you will, but you will not be able to say that that means they are more concerned with urban poverty versus rural poverty. And finally, John will, again, have a rural agenda – not because he thinks that wins elections (inside campaigns some feel there are not enough votes there) but because that is what is inside him. The forgotten America. There is no danger, none whatsoever, of his forgetting it. It would be like forgetting his own name. I will cross-post to the places you posted. It’s truly an honor to have you read my words. I should mention that, despite some problems I have with his candidacy, I’m leaning toward supporting John at the moment, so none of this should be taken as an attack on him. It’s wonderful and deeply encouraging to hear that John is so committed to alleviating rural poverty. I didn’t know that much about his background, as I was one of those fanatical Dean supporters in 2004 (and didn’t take that much time to learn about the other candidates, much to my chagrin). It’s great to hear that his won’t be an entirely urban-based campaign. But I do think that an analysis of his rhetoric is warranted, if only because that is the primary way he’s known to others as a candidate. His rhetoric is also the part of his campaign that will reverberate beyond it, inspiring and influencing people beyond even the confines of his supporters (think, for instance, of the impact the “Ask not” speech of John Kennedy (not your John Kennedy 🙂 ) had on generations of Americans, and is still having on those like me who weren’t even born when he delivered it). So if Mr. Edwards’ rhetoric isn’t matching up with his views on rural poverty, then there’s something to be said for giving his rhetoric another look. While I agree with you that Rural America is looking for complex and nuanced action on poverty, I think the same was true in 1890; I doubt there were many rural poor who truly believed that Free Silver would solve all their problems. And yet there’s something to be said for a clarion call like Donnelly’s or William Jennings Bryan’s, precisely because it doesn’t let the emotional helplessness of the poor disappear in a mountain of position papers. As someone who was energized and inspired by Howard Dean’s 2003 call “I want my country back,” I’m still waiting for Mr. Edwards to sound a similarly clear and driven note on poverty. Now, I understand Mr. Edwards hasn’t been on the campaign trail very long, and that the rural poverty aspects of his stump speech have plenty of time to come out into full view. His Winter Meeting speech was a fantastic start (far better than Obama’s, who seems to have decided it’s better to lecture the voters rather than to understand them). And it’s precisely because I think Mr. Edwards is the only one out there who gets it that I’m so hard on him. At present, I think he’s a very good, very strong candidate. I think he has the potential to be a great one if he makes his rhetoric line up with what you’ve persuasively argued are his beliefs on rural poverty. This entry was posted on Saturday, October 6th, 2007 at 7:15 pm and is filed under Uncategorized. You can follow any responses to this entry through the RSS 2.0 feed. Responses are currently closed, but you can trackback from your own site.